"Centranthus Ruber" , was introduced into gardens in the1590s, a plant from the Mediterranean , which soon escaped and became naturalised in the wild. 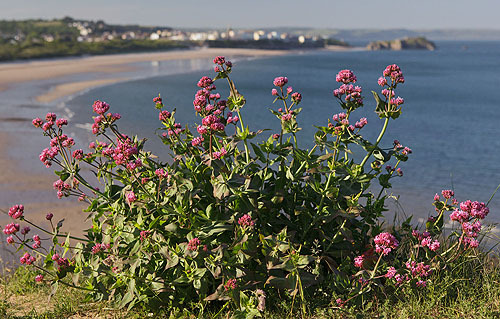 Red valerian is a robust, fleshy, perennial herb growing up to 80cm. Opposite pairs of pale green, oval leaves appear along the upright stems . At the ends of the stems, dense clusters of tiny, pink, red or even white flowers bloom in an almost cylindrical head from May to October.